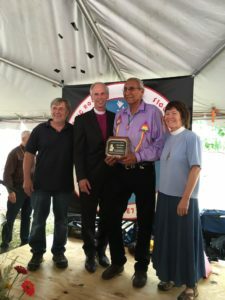 The crowd erupted in applause when my husband announced, “This year, for the first time, NRCCC wishes to give its award not to a single person but to an entire people. 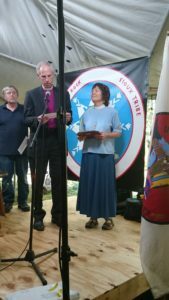 In recognition of the spiritual and moral leadership of the Standing Rock Sioux Reservation and the Lakota, Dakota, and Nakota Nations, the National Religious Coalition on Creation Care would like to present its 2017 Steward of God’s Creation award to the Sioux Nation. 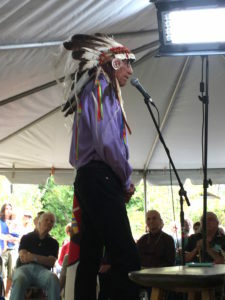 We intended to carry out a similar ceremony of confession and reconciliation that very afternoon, this time between Christians and First Nation peoples. 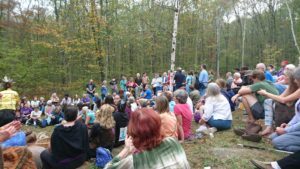 Facing the crowd, I stood on the edge of the small amphitheater, with six Christians of various denominations standing beside me. 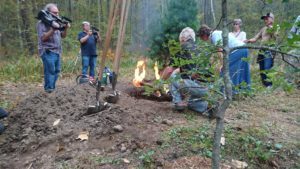 Behind us was a deep pit in the ground and a young white pine tree, its roots wrapped in burlap, which was ready to be planted. 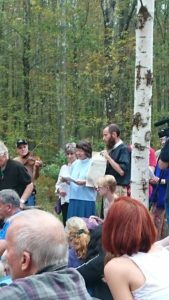 Since there was no microphone, I called out loudly: This small circle of Christians has gathered to pray for peace. 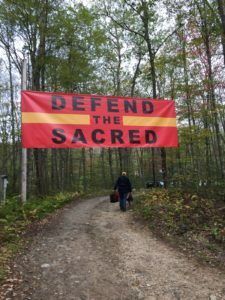 We are painfully aware of the ways that Christianity has been used over the centuries as a weapon to justify violence against indigenous peoples and violence against Mother Earth. Today we intend to burn the Doctrine of Discovery. The Doctrine of Discovery is a principle of law developed in the 15thand 16th centuries by Popes and European Kings, and eventually applied by our own Supreme Court. The doctrine held that Christian sovereigns and their representative explorers could take possession of lands that were held by non-Christians, and could do so with the full blessing and sanction of the Church. Much of the ongoing injustice and colonization suffered by Native Americans in this country over the past 500 years can be traced back to the Doctrine of Discovery.